When people say they want to make things better, what they really mean is that they want to tear things down and embark upon a major overhaul. A cardinal T-square involving the Sun, expansive Jupiter, and transformative Pluto is pushing you toward a major change. Here is your Weekend Horoscope! Get your astrology reading today! Your mate, an important colleague, or someone close to you might be encouraging you to stage a coup against your boss, a parent, or another powerful figure. If that person is going to provide backup, your chances of success will improve. Win or lose, there will still be a mess to clean up. If your beliefs aren’t providing the solace and practical guidance you need in times of trouble, you might be ready to ditch both the teacher and the teachings. Your faith is definitely being put to the test. Forget what you have been taught and make like a seeker who is new to the path. Your Weekend Horoscope reveals an intense drive to fulfill your emotional and sexual needs, although the craving is for something much deeper. You yearn to experience the sort of mystical connection that validates your existence. It’s a big order to fill. First you’ll need to discard the placeholder currently filling this space. Getting a taste of power fills you with pride and makes you feel invincible. If you undervalue yourself this is a positive thing, but it’s dangerous in the hands of an egomaniac. In either case, you will feel empowered to exert your authority in an important relationship and take control. New experiences and new information make you yearn for a change in your work life. You feel inspired and sense that there is so much more you can do. These thoughts are the beginning of a major overhaul in your employment situation. It won’t happen overnight, but a big change is coming. 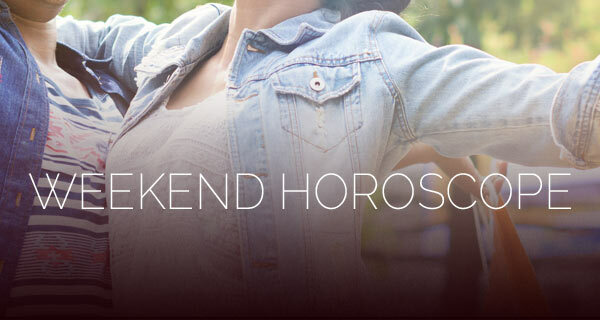 Your Weekend Horoscope reveals that you possess a sense of your own worth, albeit exaggerated. This may compel you to make a play for greater control over a situation playing out in your love life. You will probably take matters too far, but that might be what it takes to force change. You are under pressure to make a sweeping change in your home and family life. Even if you feel confident that you can manage it, you could still get in over your head. This is going to be major! Things will be upside down for a while before they can be set right side up. Blind faith in yourself and your authority could fuel an epic rant. Your words have never been more powerful than they are right now, so you should choose them with great care. Think of the good that you can do when you use them to empower and uplift the people around you. You are feeling lucky, so you might be inclined to take a big financial risk. Only time will tell if it turns out to be in your favor. What you should know is that you could have a financial breakdown before you have a breakthrough. You’ll need a safety net if you’re going to take a leap. Your Weekend Horoscope indicates that people may be pushing you to exert your authority over a certain situation. The problem is that only you will be held responsible if things don’t go according to plan. On the other hand, what’s the point of having power if you don’t use it? Information overload can bring about a psychological or spiritual crisis—especially if you are following too many paths or seeking guidance from too many teachers. Shut out the world and tune in to your own inner wisdom. Only you know what you need to do to heal. Beware of looking to the future to magically fulfill all of your financial dreams—especially if your current spending and savings strategy is working against your own best interests. Just remember that it is what you do now that will determine your financial destiny. Align your actions with your goals.